Ceramides are unsung skincare heroes. They are an oily wax (the name derives from the Latin word cera, which means wax) that makes up, together with other substances, the glue that holds skin cells together. Like all good things, they deplete with age. It’s part of the reason why our skin becomes thinner, drier, and wrinklier as we get older. There are nine types of ceramides. Six of them are naturally found in our skin. The types of ceramides used in cosmetics are usually synthetically made in a lab. Then, there are phytoceramides. They are derived from plants. Actually, phytoceramides in cosmetics are usually derived from yeast. 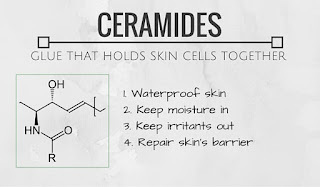 Why are ceramides so good for the skin? Ceramides waterproof the skin. It keeps moisture in, preventing skin from becoming dry and cracked. This makes them a must for those of you who have dry skin. It keeps bacteria, germs, pollutants, and all sort of nasty stuff out of the body. This prevents infections and irritations. If your skin is sensitive, choose a moisturizer packed with ceramides. 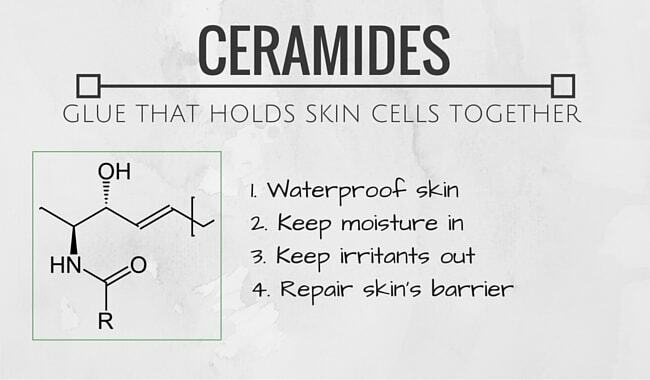 Ceramides don’t just prevent dry and broken skin. They can also help fix it. When the barrier that keeps skin healthy breaks down in places, allowing moisture to evaporate and irritants to attack skin, ceramides fill in the gaps, encouraging skin health. To see the best result you should combine ceramides with cholesterol and free fatty acids They form what scientists call “crystalline lamellar structures,” which have amazing moisture-retaining properties. Triple Lipid Restore 2:4:2 is an anti aging cream formulated with a maximized concentration of lipids: 2% pure ceramides, 4% natural cholesterol, and 2% fatty acids. This unique anti aging lipid correction cream contains the first 2:4:2 cholesterol-dominant ratio to help restore skin's external barrier and support natural self-repair, while potently nourishing aging skin for improvement in visible signs of accelerated ageing. 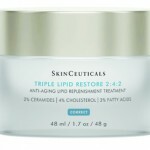 Triple Lipid Restore 2:4:2 has been clinically proven to improve the visible appearance of skin smoothness, laxity, pores, and overall radiance. Lipids are natural compounds found in skin. While there are many kinds of lipids, ceramides, natural cholesterol, and fatty acids are the predominant forms. With age, lipid production declines, impacting barrier function and natural self-repair. As a consequence, accelerated visible signs of ageing appear such as skin roughness, uncomfortable tightness, dullness, and loss of facial fullness.